A man from Virginia says his father took a few photographs last Saturday of what he thinks may be a Bigfoot. The area where the pictures were taken is along an inter-coastal waterway in Virginia. Apparently these pictures aren't just a coincidence. 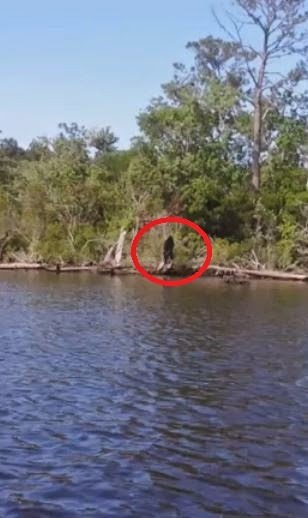 They were taken by a guy and his friend while fishing at the exact same spot where they had seen a Bigfoot 25 years ago. "Finally, a photo that is not blurry nor hidden behind a tree. A clear photo of Bigfoot standing out in the wide open. You be the judge." Real Bigfoot or a Stump Squatch?